In a scathing attack on Prime Minister Narendra Modi and BJP president Amit Shah, the AAP chief said the duo plan to change the Constitution on returning to power in 2019, “just like Hitler did in Germany”. “Hum Congress ko mana mana ke thak gaye gatbandhan karlo, gatbandhan karlo,” Delhi Chief Minister Arvind Kejriwal said Wednesday, expressing frustration over the party’s “refusal” to form an alliance with the AAP in the national capital. 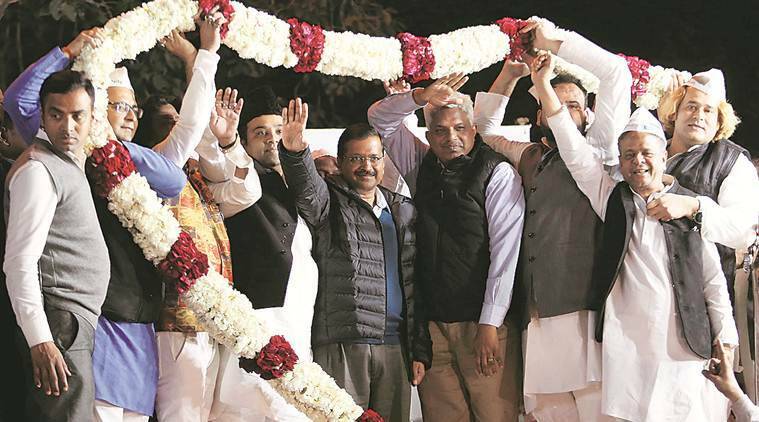 Addressing a rally near Jama Masjid, Kejriwal said he wasn’t sure what was in Congress’s mind, but a coalition would have helped wipe out the BJP from Delhi in the Lok Sabha polls. “I believe everywhere there should be one opposition candidate against BJP candidates. Hum Congress ko mana mana ke thak gaye, gatbandhan karlo, gatbandhan karlo (We got tired of trying to convince the Congress for an alliance). I want to ask, should there be a coalition or not? If there is a coalition, the BJP will be routed in Delhi… I don’t know what is in their (Congress’s) mind,” Kejriwal said. “If I have enough faith that the Congress will win all seven seats in Delhi, then I am ready to leave all seats to them,” he said, adding after a pause that “they won’t”. In the corner meeting at Jama Masjid’s Gate No 1, Kejriwal added that the Congress was trying to weaken the SP-BSP alliance in Uttar Pradesh and jeopardise the AAP’s prospects in Delhi. “I don’t understand what they are doing in Uttar Pradesh. They are trying to weaken the SP-BSP in UP and the AAP in Delhi. Congress chahe aaye na aaye — Congress ne mana kar diya hai — (but) I have full faith that the AAP will win,” Kejriwal said. “They (Modi-Shah) have done what even Pakistan could not. Pakistan always harboured ambitions of creating rifts between communities in India, but was unable to. The Modi government has done it in five years. If Modi and Shah return, this nation wouldn’t survive, democracy won’t, Constitution won’t. Every patriot should have one objective: to defeat Modi and Shah,” he said. Kejriwal urged the crowd to internalise the “electoral math” of the city, saying that the BJP’s vote share will go down by at least 10% from the 2014 Lok Sabha polls, and that should go to AAP. “If that goes to the Congress, the BJP will romp home. That is why I have heard that the BJP and RSS people are actually campaigning for the Congress. They want to split votes and ensure the BJP wins. These days, TV channels have started showing Rahul Gandhi a little more. But do not fall in the trap that this vote is for electing the PM,” the CM said.